They might be big boys’ toys, but pushing and pulling your caravan, boat, trailer, light aircraft or helicopter into position is anything but child’s play. In fact, it is often frustrating and time-consuming. Campertrolley makes the job quick, easy and safe. Just attach your Campertrolley and operate the simple hand-held remote control. Ten minutes after you have arrived your powerful, all-terrain Campertrolley will have your caravan, boat or plane positioned perfectly. Watch our video to see how Campertrolley will make your next caravan, boating or flying holiday a breeze. 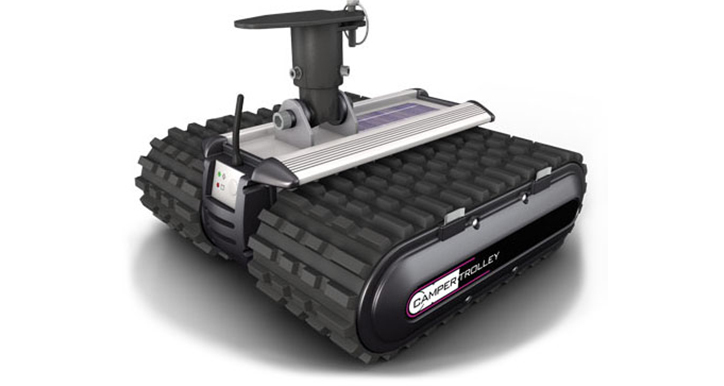 Campertrolley doesn’t just look like a space-aged mini-bulldozer. It is! Campertrolley puts an end to endless reversing, and backbreaking lifting and pushing. Using powerful twin planetary gear motors, it can move forward or back, left or right at the touch of a button on your personalised remote. 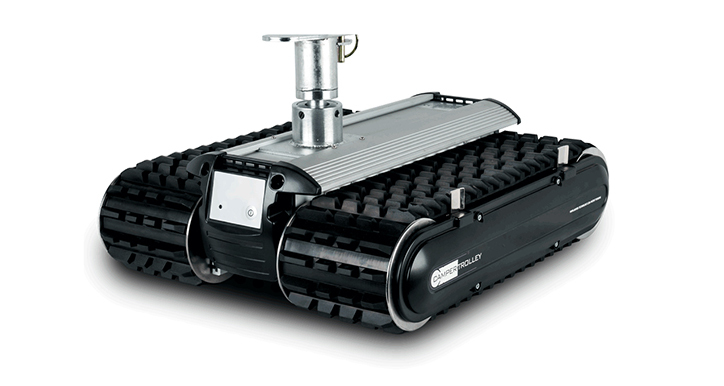 Campertrolley’s heavy-duty, rubber caterpillar tracks are at home on virtually any surface – grass, hard soil or gravel, as well as concrete and asPhalt. at nine metres a minute You’ll never have the embarrassment of finally having to give up and get help from one of the blokes who’ve been smugly watching you. Campertrolley incorporates cutting-edge technology and microelectronics. It is powered by a 14.4 volt lithium ion battery that can be recharged using mains electricity or the sun. The battery is recharged using a 240-volt re-charger supplied with your Campertrolley. Or, you can let the sun do the job free. Its inbuilt solar panel will fully recharge your Campertrolley. It takes only a couple of minutes to fit the bracket to the drawbar and your Campertrolley to the bracket. No tools are needed, no special electrical wiring has to be installed. Campertrolley is operated by a hand-held remote control, which comes with batteries included. Your remote is individually security chipped and coded to your Campertrolley. No other remote control unit can operate your machine. If your remote control is lost or damaged, a replacement is available from your dealer. Campertrolley not only works well, it looks great too. Campertrolley is the safe and easy way to manouvere your caravan, boat or light plane into position. Because you control the positioning of your caravan, boat or light plane using a remote, you can move to the best vantage points to adjust Campertrolley’s direction in safety. The simplest way to operate Campertrolley is to stand in the location you want to park your van, boat or plane and bring it towards you. While it looks like a toy, Campertrolley should only be used by adults. Unlike other remote-controlled movers, the Campertrolley does not need a jockey wheel to help manoeuvre your caravan, boat trailer or light plane into position. The Campertrolley acts as the jockey wheel. So, there’s no more getting bogged, or damaging your jockey wheel or draw bar. Other remote controlled movers require expensive, after sales installation. Water tanks and plumbing often have to be relocated. With Campertrolley, you’re ready to get moving! Visit Camper Trolley’s website for full specifications. Talk to A&K Caravans and Motorhomes today – and let them show you just how easy Campertrolley is to use. We promise, you’ll be moved!